I have always vacillated between buying supplies for our pets (two dogs, one fish and two rats) at the North Lincoln Pet Supplies Plus location and Petco in my neighborhood. My most recent shopping experience ensures that I will be shopping exclusively at Pet Supplies Plus. From the time I walked into the store, I was greeted warmly by Augestine as I looked for small animal bedding. He smiled and carried the bedding to the register for me. When Dawn rang me up, I asked her how her day was going and not only did she thank me for asking, she reminded me to use my rewards card and gave me a coupon for an additional 5 dollars off from my local pet magazine. After I paid, Israel helped me load my car and when I asked him about how his summer was and if he was in school, he told me a little bit about himself and where he is in junior college. I shared how I started the same way before getting my bachelors degree. 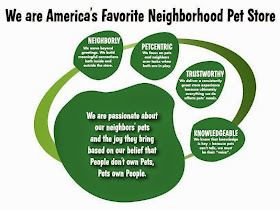 More companies and individual pet supply stores should handle customer service in the way my Pet Supplies Plus does. I left smiling and looking forward to coming back.